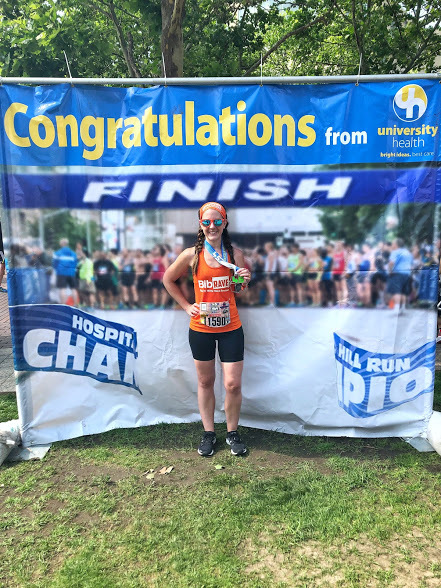 "Disclaimer: I received free entry to the Hospital Hill race & a sample of NuGo Egg White Protein Bars as part of being a BibRave Pro. Learn more about becoming a BibRavePro (ambassador), and check out BibRave.com to review find and write race reviews!" It seems a little surreal that this half marathon is already over! I feel like it was just yesterday I started my training plan for this race with the hopes of a PR in mind! Spoiler alert, I got my PR and couldn't be happier! The weekend started out great, I was traveling with my Mom and Sister (My Mom ran the 7.7 mile and my Sister was our support system on the trip! ), so we met up in the early afternoon and hit the road for Kansas City, MO! We are coming from St. Louis so it was about a 4 hour drive, totally doable and the perfect little getaway distance! Once we got there our first stop was the expo, I was really excited for this expo since I had been seeing all the posts from Hospital Hill's Instagram account about it. Sadly when we got there they were already taking down a good amount of the booths or the booths were already empty. We grabbed our bibs rather easily and then did end up walking around the booths that were left. We did score some extra Hospital Hill swag though in their merchandise booth! Then headed to our hotel which was about twenty minutes away from the hotel where the expo was being held and where the start line was located. We decided to head back downtown for dinner and drinks before hitting the hay. We ended up at a local eatery called Char Bar. I'm such a huge fan of BBQ and smoked meat so this place was legit everything! Once we got back to the hotel we got our stuff ready for the race. I had everything laid out nicely and of course took my #flatrunner picture! You'll notice that I have some NuGo Egg White Protein Bars stocked up and ready to go... Since they are made of completely REAL food (no added sugars or artifical ingredients) I knew this was what I wanted to not only carry with me on course (in my Orange Mud Gear Vest) but also to have one waiting at the finish line to refuel post race! On the ride home, breaking out the NuGo! Once everything was out and ready to go we went to sleep. I personally got a really good nights rest, my Mom and Sister who shared a bed, I don't think they enjoyed it that much! We woke up really early, about 5am to get going! When we woke up the weather was way less than ideal, super crazy winds, pouring down rain and lightning. I was really nervous the race was going to be cancelled. The night before the half marathon (so Friday night June 1st) they canceled the 5k that was planned due to excessive heat. The new plan was to have the 5k, 7.7 mile and half marathon all on June 2nd. It was really looking like the entire weekend may have to be scrapped. I know there were a ton of people who were upset the race was cancelled Friday night and while I get their sentiment I also feel like the Race Director and those working with the Hospital Hill race ONLY had the runners best interest at heart. I can only imagine how tough the choice had to be to postpone the 5k, and I'm sure they didn't take the decision lightly. Ultimately, I feel like they did what was best for the runners, it was crazy hot, miserable hot even! It was good to know that the RD and crew had racers in the forefront of their minds when making these decisions, which gave me extreme confidence heading into Saturday that the right choice would be made. We got to the start line, weather still wasn't ideal. The rain had almost subsided but it was windy and still bouts of lightning. I was a ball of nerves to be honest. We had VIP bands and attempted to find the tent, personally I was all over the place emotionally and couldn't figure out where the tent was, when in the end it was right in front of where we ended up being! Me and race morning's just don't jive. Anyway, the race was postponed only a half hour. Heading to the start line I was able to meet up with two other BibRave Pro's, and we snapped a pre-race pic and we were off! It was a bit windy and very cloudy to start out with but I was really happy it wasn't blistering heat. Given the fact that the race is in June in the Midwest, the odds are pretty good it was going to be beyond hot! The weather cleared up, it did get hot but all in all I felt like it was the perfect day to race! 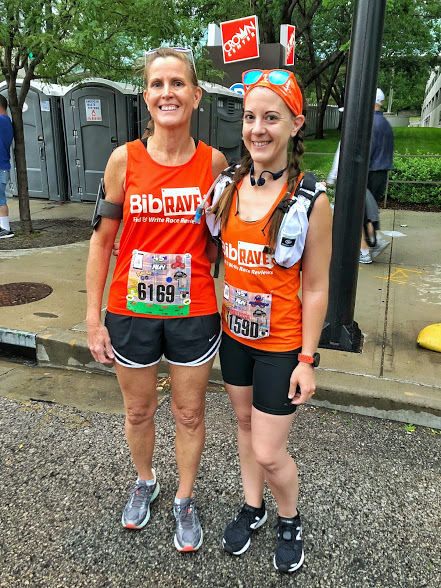 I decked my Mom out in BibRave orange for the race too!!!! Now given the name, Hospital HILL, I knew it was going to be hilly and as a general rule I really don't like hills. However the difference with this race was that I went in PREPARED, overly prepared actually, for what I was getting myself into. I wasn't shocked at the amount of hills nor did I get bent out of shape when I saw one on the horizon. I implemented my plan of taking the uphills slow and sprint down. It worked, all in all, it worked like a charm! All in all there was about 718 ft of elevation gain for this half marathon... To put it in perspective, the GO! St. Louis FULL marathon has about 552 ft of elevation gain! I averaged a 10:35 minute mile throughout the race, granted I wish I was faster (runner problems!) I am beyond happy that I was able to achieve that time on that course. It put me in at 2:18:34. My previous PR was 2:35:49 in April of 2017. Gaining that much on my PR still makes me so happy when I think about it. How cool is this certificate I downloaded from Athlinks?! I immediately claimed my results and was able to score this awesome certificate! The course was gorgeous, I honestly felt like I was running through a really small town. The spectators were incredible and it seemed that there was always someone outside cheering us on. There was even a few who had sprinklers out on the edge of their lawns pointing them into the street for the runners! Also a HUGE shoutout to all of the police officers who were working the traffic crossings. They rocked! I have never ran a race where cars were allowed to cross the running path during the race, with direction of course! These police officers stood out there all day helping us out and making sure we were safe, and they cheered us on to boot! Talk about an incredible community support! Also, free race photos?! Yes, please! The only problem is, I don't run pretty, so out of about 18 photos I think only 3 look decent in my opinion! Then there was the post race party, I was blown away! Seriously, it was so well put together in my opinion. There was so much going on, so much to do!! I ended up finding the VIP tent finally and was able to take advantage of a post race massage (never had one before and now I may be hooked), had something to eat and they also served us mimosa's!!! The volunteers working the VIP booth were awesome, friendly and made it known they were there for us, so cool! Also, check out the medals, I'm all about a nice medal and this one has jumped to the top of my faves! Aside from the VIP experience we had a Beer ticket, a Wine ticket and a Food ticket on our bibs... 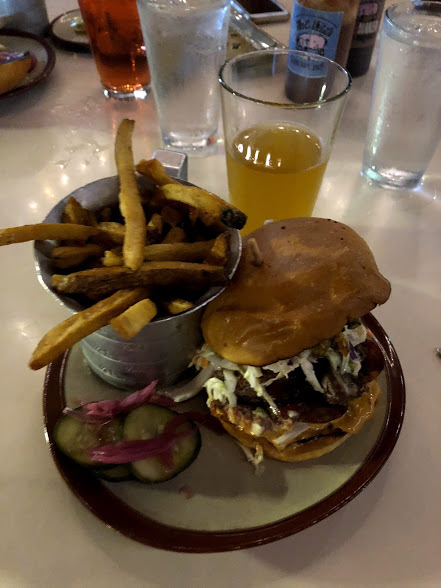 I have only ever had a Beer ticket before so the Wine and Food was new to me. Turns out they had an entire pancake breakfast waiting for the runners at the end as well! So you can grab some beer and/or wine, get a great breakfast and not have to travel but a few steps of each other! We walked around for a while and basically just hung out. The highlight of that part of the day, a lady walked up to me and asked, "What is BibRave?" I was so excited to share what BibRave is all about! 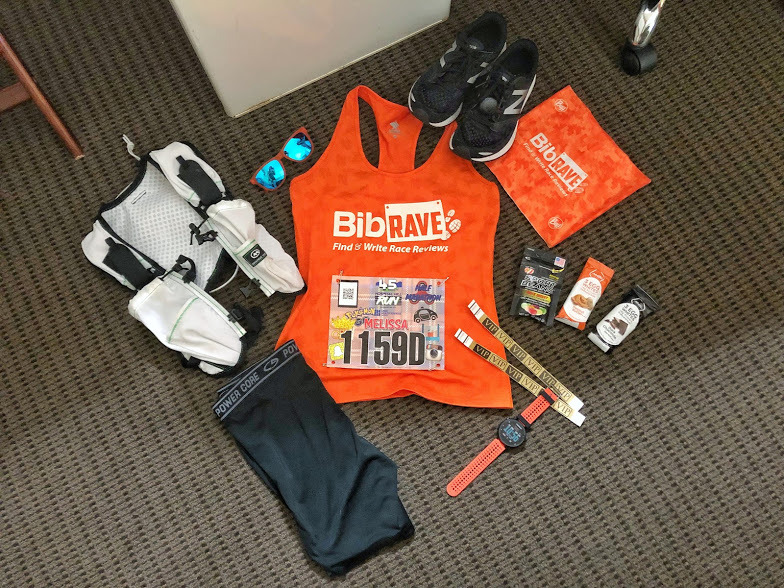 Turns out she had found our BibRave discount code and used it to sign up for the race, she just wasn't sure exactly what it was! Once we had taken part in all of the post race activities we headed on home. The entire race experience was incredible in my opinion and I have already recommend the heck out of it on every platform possible! 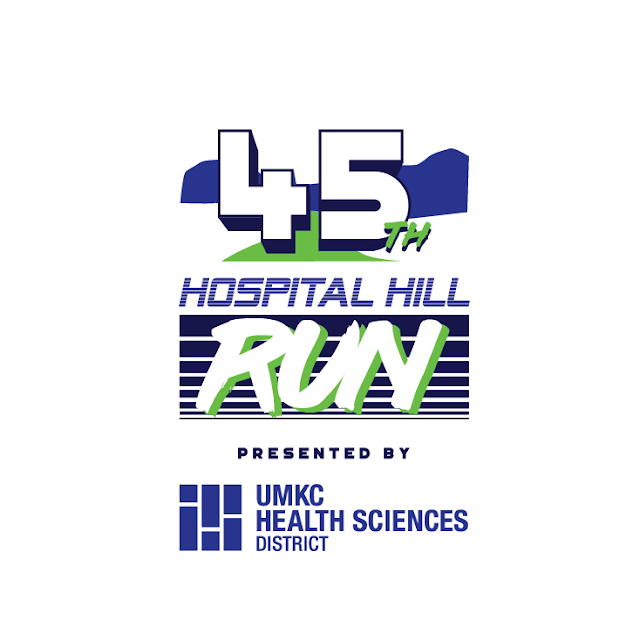 I'm already planning on next years race and would LOVE to turn this a race I do yearly... I would LOVE to be a part of the Hospital Hill family from here on out! 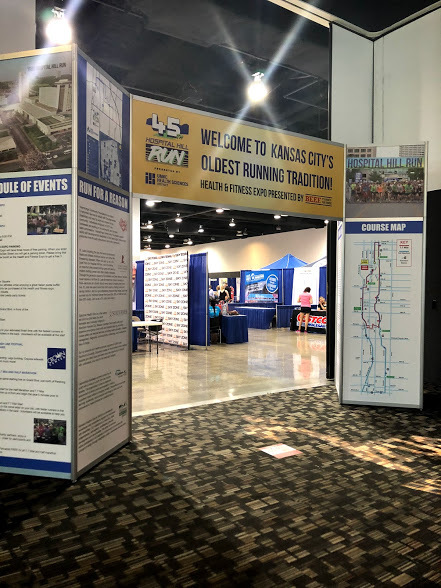 If you're looking for a late Spring half marathon and are interested in coming to Missouri, I can't recommend this race enough! All around such an incredible race experience! !